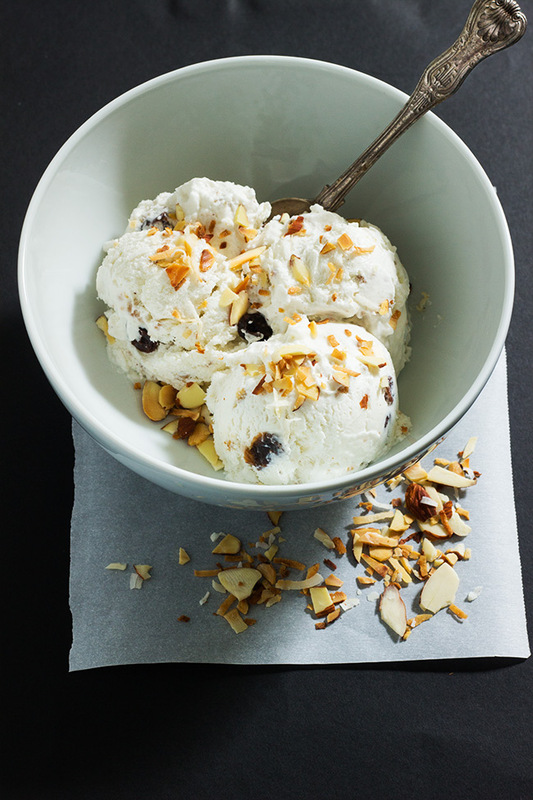 This easy rum raisin ice-cream is the grown up version of the classic vanilla ice-cream. It has crunch built in with the addition of some grape-nut. The fact that this is a no churn ice cream makes is super easy to make and more importantly enjoy. I mean really, it is 78 degrees outside and that is all the encouragement that I need to make ice-cream. Can I just say how happy I am that it is almost summer? Isn’t spring just a preview of what is to come? Summer is made for lemonades, popsicle and ICE CREAM. So let’s just pretend it is summer and eat more ice-cream. And on a side note I had this last night after watching TWD. I needed it. So once again condense milk comes to the rescue. 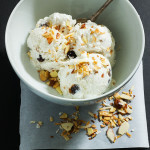 Basically, this ice-cream is made up of condensed milk, rum, raisin, coconut milk, grape-nut, and a lil heavy cream. The rum helps with the texture of the ice-cream. Because I refuse to buy a ice-cream maker that makes this a win-win-win recipe. So my life goals are complete. I have finally done it y’all, my mom is over the moon involve with this rum and raisin ice cream. She is a big fan. Se light had a moment. I mean like stop the press- call your best friend- post a Facebook rant- kind of moment. 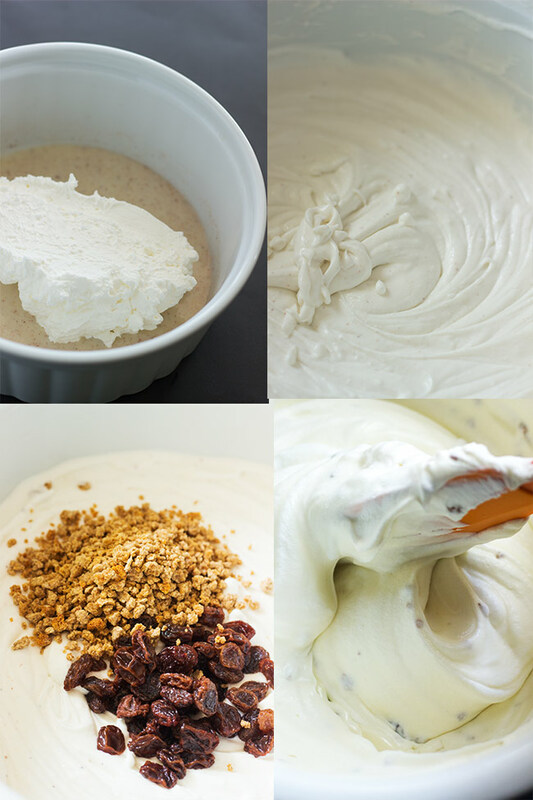 It is creamy, rich, fluffy, perfectly sweet, scoopable, seriously simple and super easy. I made a tub for almost everyone that I know. For whatever reason: college graduation- you get a tub , job promotion- you get a tub , putting spring bulbs in the garden- you get a tub . It doesn’t matter why EVERYONE GETS A TUB! Yup, I totally had an Oprah moment. It felt good like I was helping my friends and family to get to the next level. 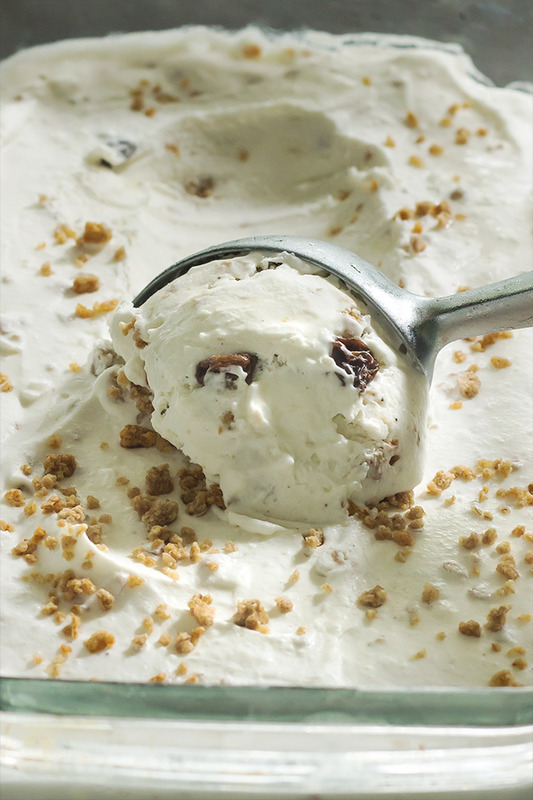 This easy rum raisin ice-cream is rummy and yummy in my tummy. And because I love you guys I want you to make this… just do it. You will thank me. I’m sure about this. In a small bowl add raisins. 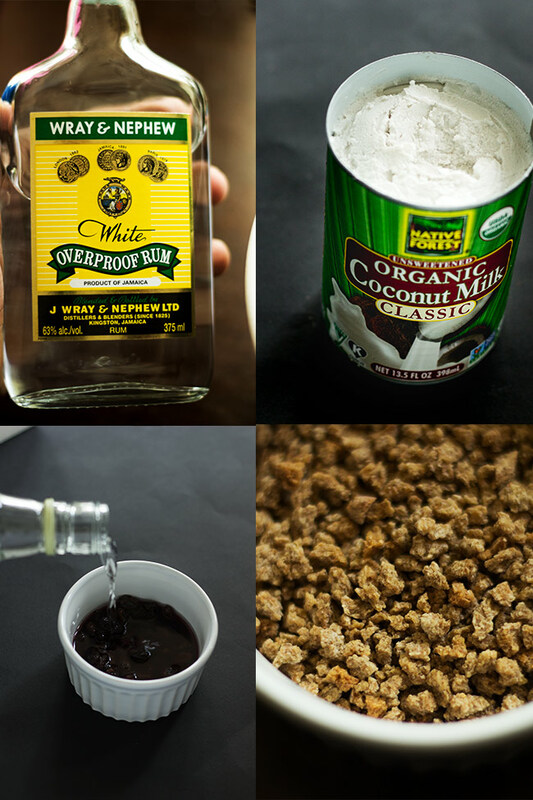 Pour 1 tablespoon rum and enough grape juice to cover the raisins. 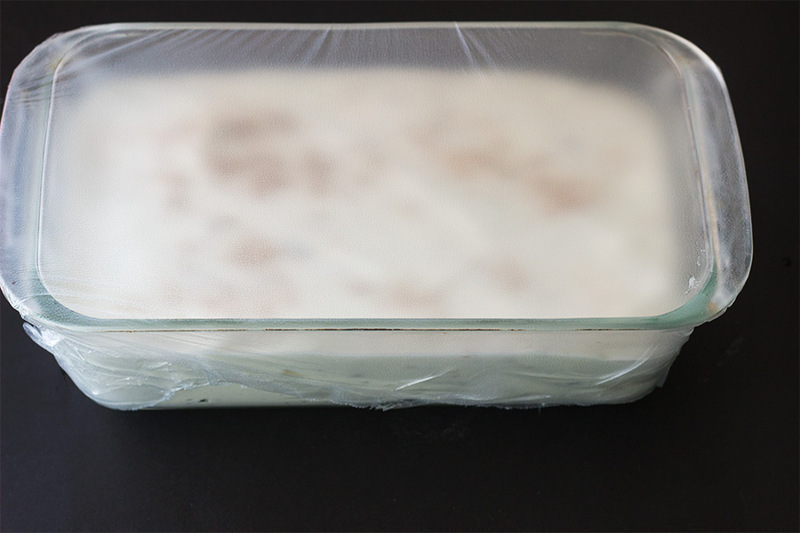 Cover; let stand at room temperature 4 hours or overnight. Take the can of coconut milk and place it in the refrigerator for at least 4 hours but overnight is best. In a large mixing bowl, whip the cold coconut milk until it becomes fluffy. Set aside. Whip the heavy cream until it forms peaks using the bowl from the freezer. 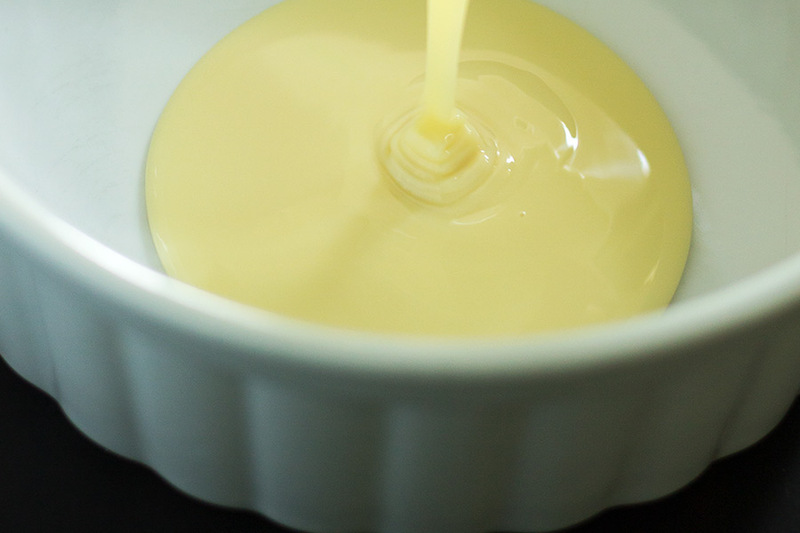 Pour condensed milk in a large bowl, add in a small amount of the whipped cream and remaining rum. Whisk to combine. Combine the remaining coconut milk and the whipped cream. Add the raisins, grape-nut, nutmeg. Whip until fully incorporated.Taste and adjust flavors as needed. Set out for at least 20 minutes prior to scooping. I stopped by for one simple biscuit recipe and wind up with several more. I haven’t tried any yet but it’s so obvious that you know what your doing. Rum raisin ice cream is my favorite ice cream and this will be done today! Yeah it’s 46 degrees, annnnnd? 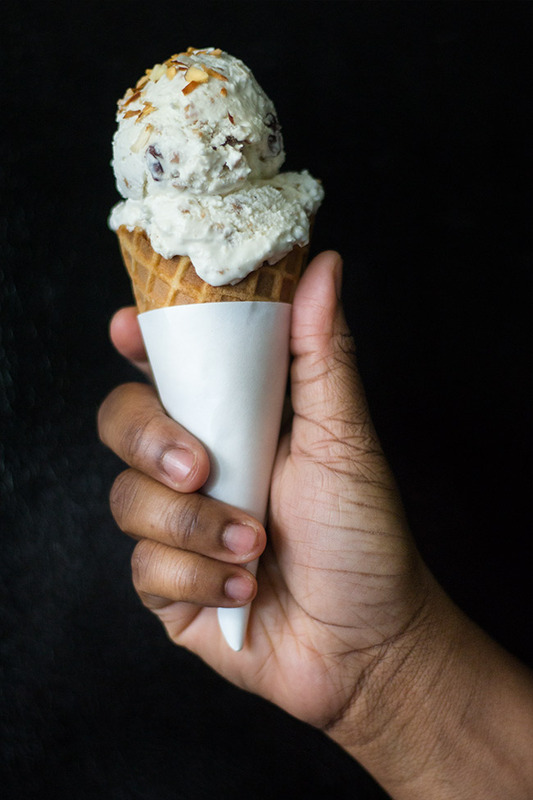 Rum raisin was my favorite ice cream growing up. I am going to make this. I love that I do not need an ice cream maker. The ice-cream looks so yummy. Im pinning it to my board and will definitely try to make it especially now when Spring and Summer are on board. Thank you so much Ninz!!! I hope you like it. I love rum and raisin ice cream. This looks great! Thanks Jared! I love it too and no churning just makes me love it even more. Thanks Cabdy!!! I love that this is so super easy to make. I use the same kind of coconut milk…actually I should correct myself I used few times. Whenever I make sth. with coconut milk it is not really successful. Not sure what I am doing wrong:( The ice cream looks incredible. I would love to try yours! I love rum and raisin ice-cream. I’m so glad that I found this recipe. And I never thought to put granola in there. Genius!!! Thank you Claudia!!! Yup the grape nut adds some texture. During the setting process the grape nut absorbs all of those great flavors. LOVE LOVE LOVE LOVE LOVE!